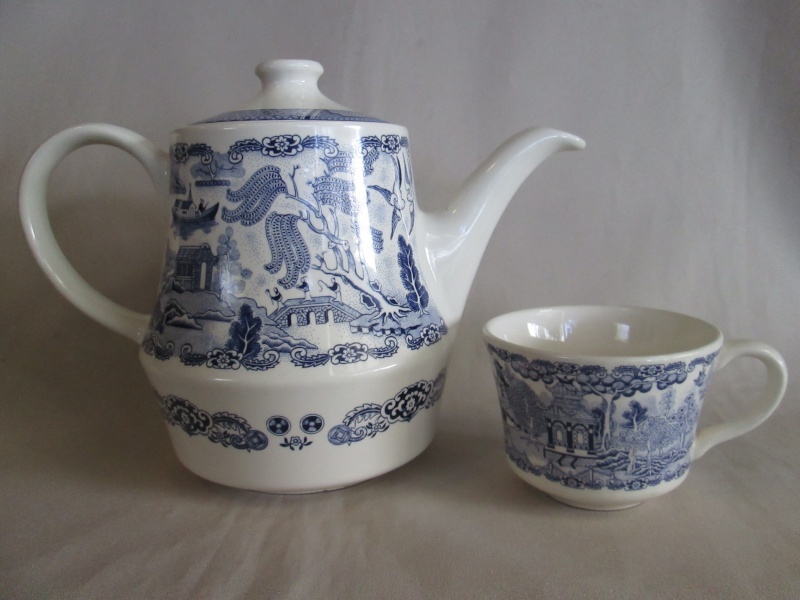 I collect Willow pattern china (have done so for most of my life). I have a lot of Crown Lynn pieces that I do not know much about and thought perhaps you could enlighten me. 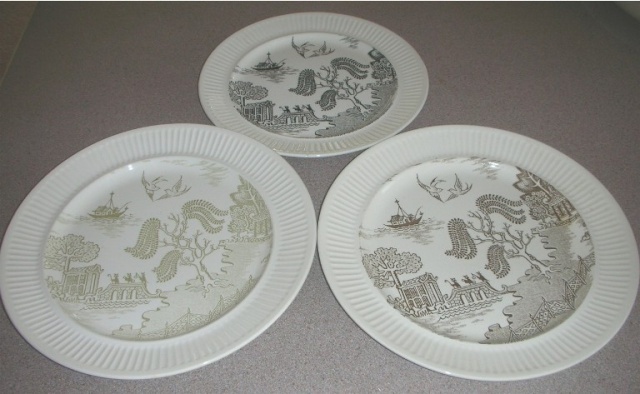 The first photo attached is of three different sets I have of Crown Lynn Willow dinnersets. I have place settings for 8 to 24 in these sets. 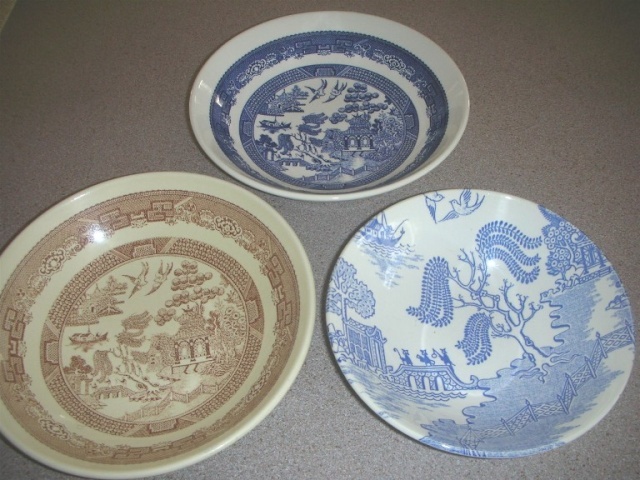 I know the blue and white one with the standard Willow pattern was probably made in the 1970's or 80's but not sure of the brown set (hard to find) or the Kelston Willow set (this is the only one featured in the Crown Lynn book that was published a year or so ago). The next photo is of a brown cup with a brown and White Willow saucer. I have 4 of these and have only seen one other set. The bankstamp says Genuine New Zealand Ironstone Mandarin D116. Lastly, the photo is of a coffee mug that is unmarked. I was sold as Temuka but it has the Crown Lynn Willow on it. The mug is a teal colour with the blue Willow. Also I would like to know if it was made in Pink Willow as I was told it had but have never seen a piece. 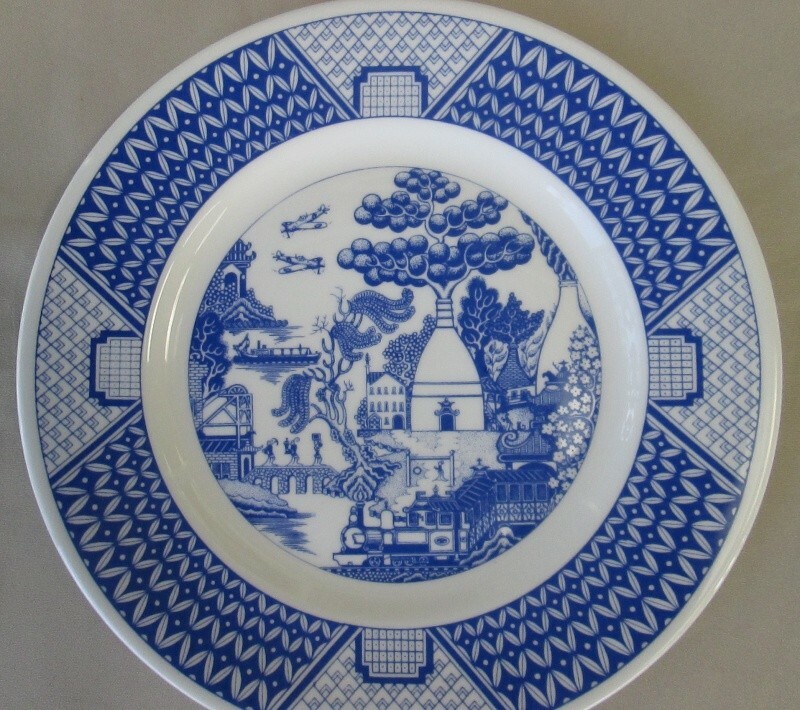 I have one side plate in the same pattern as your first Blue Willow plate. It has Made in NZ. on it with the Crown Lynn long low coronet. Val Monks book estimates that this stamp was used in the 1970's and 1980's. The backstamps are a big help in trying to find out when things were made by Crown Lynn. 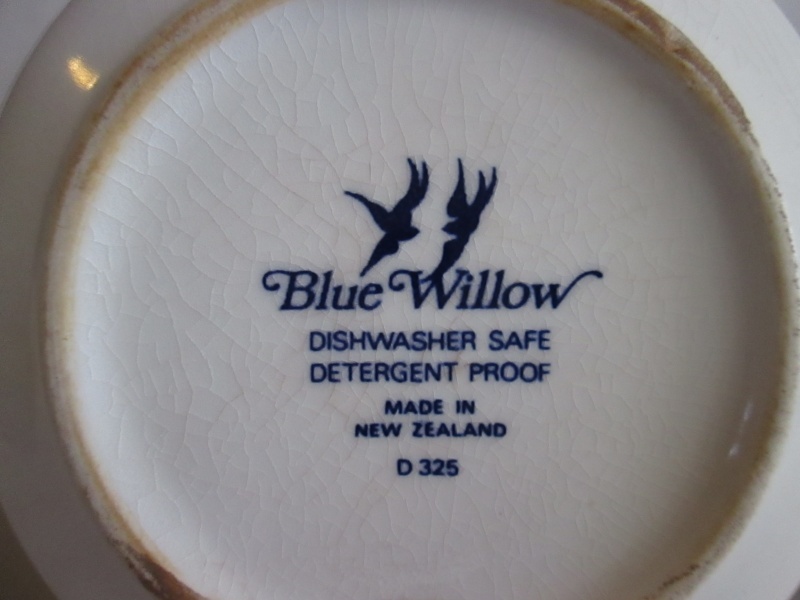 It's interesting to read in Crown Lynn a NZ Icon, that the Blue Willow was first made in 1968. There was a pale blue, a dark blue and black and white. No mention of brown or olive however. 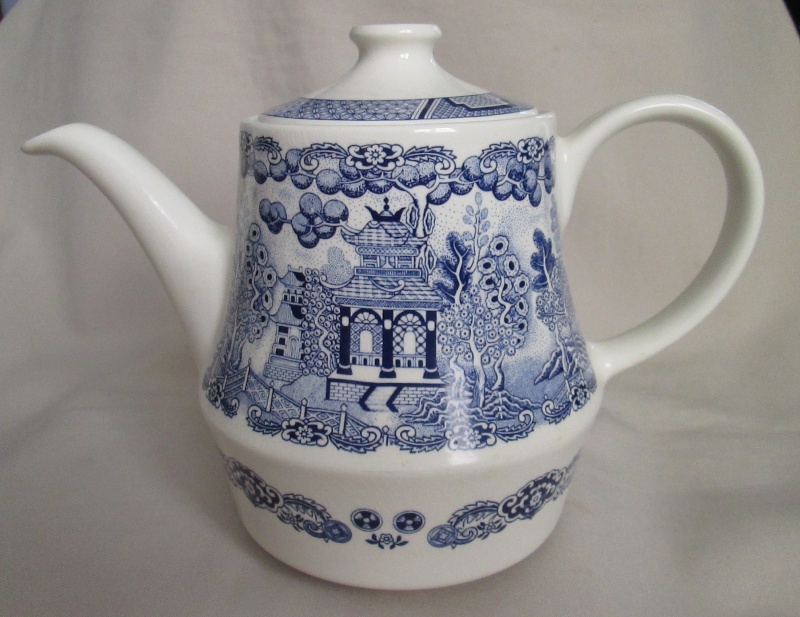 Shape 1370 Teapot with a Bordered Willow Pattern, thanks Jeremy for pointing this out to me. I had thought this the same as my everyday willow but got home and realised its a bit different. 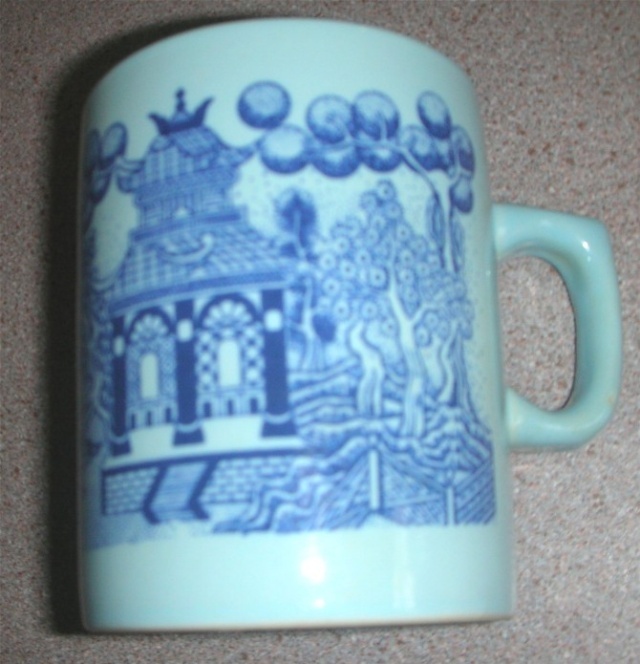 This Willow pattern has been adapted to reflect the local industries of Stoke-on-Trent. The temples have been turned into Bottle Ovens and Pithead Winding Gear. The boat is a Canal Barge, the fence a Steam Train & the birds have become Spitfire Planes. The 3 figures carry miner's pick, a pot & a saggar. 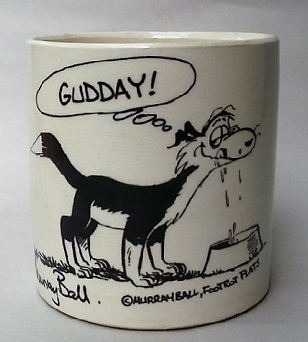 The design represents the areas Ceramic Heritage as well as the Coal Industry-invaluable for pottery firing. The Spitfire was designed by locally-born Reginald Mitchell. Other city versions of this design were produced but this is my favourite. Oh Wow!!!! 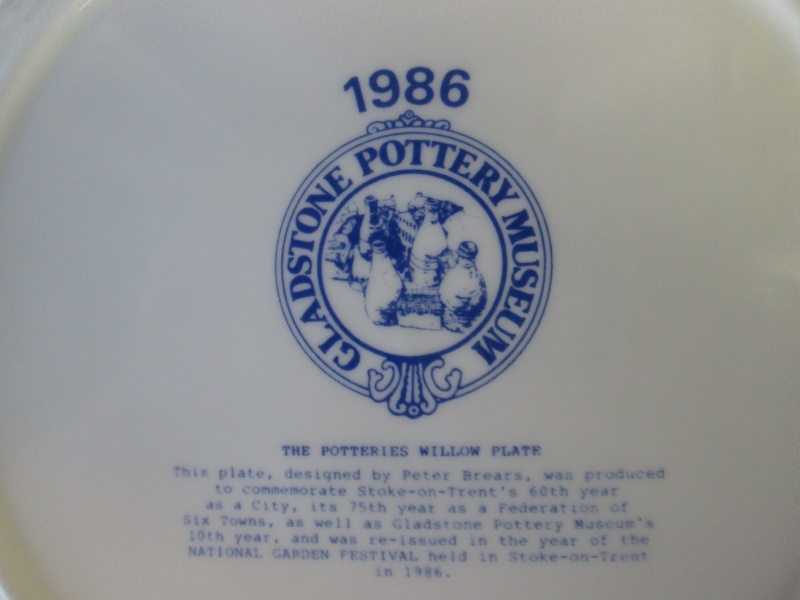 that Gladstone Potteries Willow Plate is the BEST!!!! We still have a lot of the Willow patterns to find yet on the different shaped ware and I'm sure that they would have different pattern numbers, but who knows. Thanks for this one as this is a good start. It looks like it's from the latter years going by the teapot shape. Looking thru my dinner set I have matching rim shape bowls with d254 & D325 so they may have released the Bordered Willow Teapot above with the regular d254 dinner set. 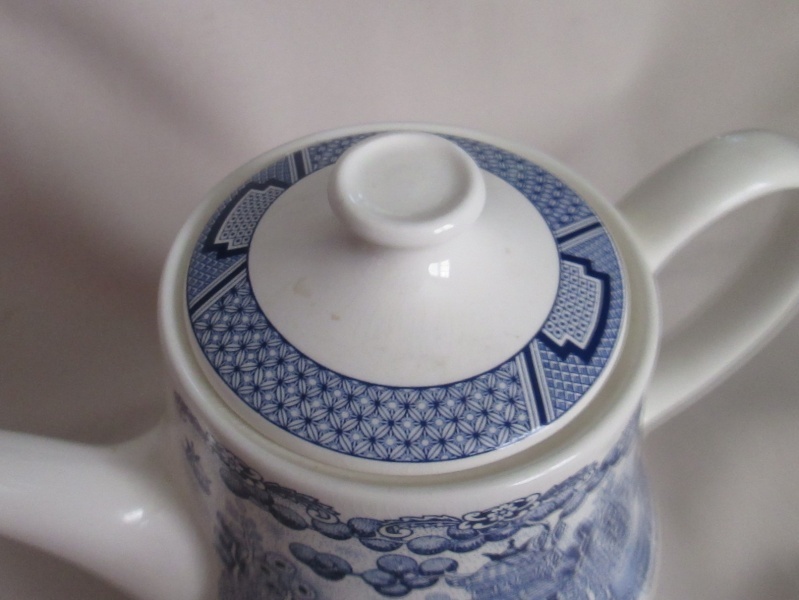 I also have a shape 25 Jug with this bordered willow pattern. Your 1370 Teapot is from the Classique range and was first made in 1983. The matching cups are shape 3056 and I have a few of these. The Brown Willow is also made in the Classique shape and I have only one of these. 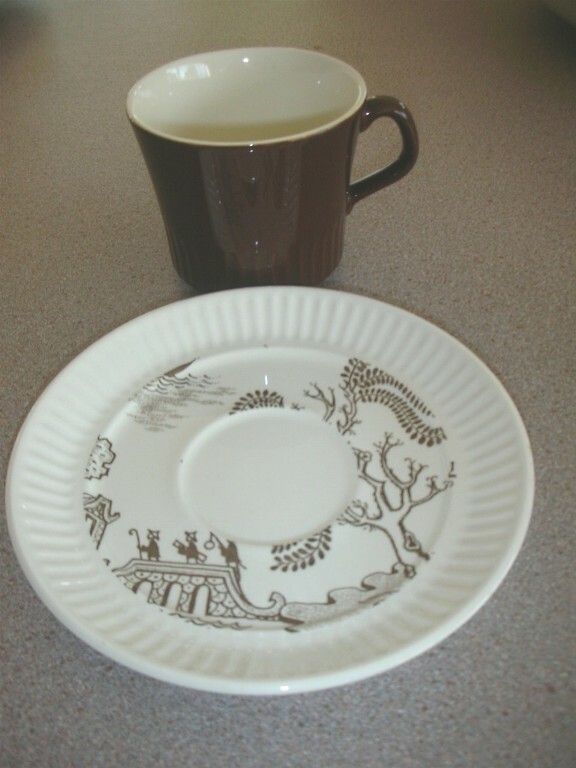 There is the Apollo ware above and the Rimmed shaped ware and of course the coupe shaped ware with the 3019 cups. Plus who knows what else until we find them.